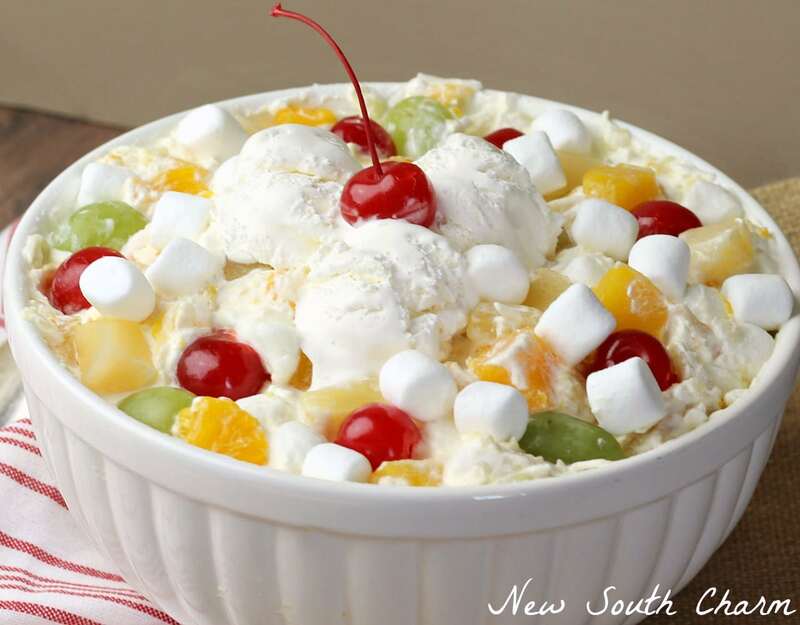 Every Southerner knows that Ambrosia Salad is a wonderful creamy fruit salad that usually makes an appearance at family reunions and holiday parties either as a side dish or dessert. No matter when you serve it though it’s always a crowd pleaser. The holidays are almost here and for my family that means spending time together sharing making special memories. It also means one other very important thing… food. If you haven’t caught on by now around here we like to eat. I know you’re thinking who cares about food. I’ve got a house to clean and decorate. Then I need to buy a ton of presents. I’ll worry about the menu later. I know that’s what I keep thinking too. But, take just a minute to remember those holidays of your childhood. You might remember a few presents if they were particularly good or really bad. Maybe that crazy aunt that came every year with the green jello? Probably next thing you thought that special dish that you only had at Thanksgiving or Christmas. Maybe it was dressing or green bean casserole? Maybe it was a special cake or pie? Every family has at least one dish that they look forward to every year. For us that’s this Ambrosia. My grandmother made Ambrosia every Thanksgiving and Christmas. It was as certain as the turkey. For a few years after she passed away no one made it. I’m not really sure that anyone noticed or if they did no one mentioned it. It just wasn’t on the table. Then a few years ago I started hosting Thanksgiving in our home. So when it came time to plan the menu Ambrosia was at the top of the list. One of the most precious moments of that first Thanksgiving was my Daddy telling me he’d like me to it again for Christmas. I still smile thinking thinking about that memory. Making this is actually really easy. All you need to do is combine the fruit and coconut flakes in a bowl. Then stir in half of the whip cream a spoonful at a time. Then add in most of the marshmallows. Give everything one last stir. Spread the remaining whipped cream over the top. Sprinkle a few marshmallows on the top and add a cherry for color. Thanks so much for stopping by New South Charm! I hope you’ll find a recipe or two you’ll love. Are you following New South Charm on Facebook? I’d love to hear from you; drop by and say hello! 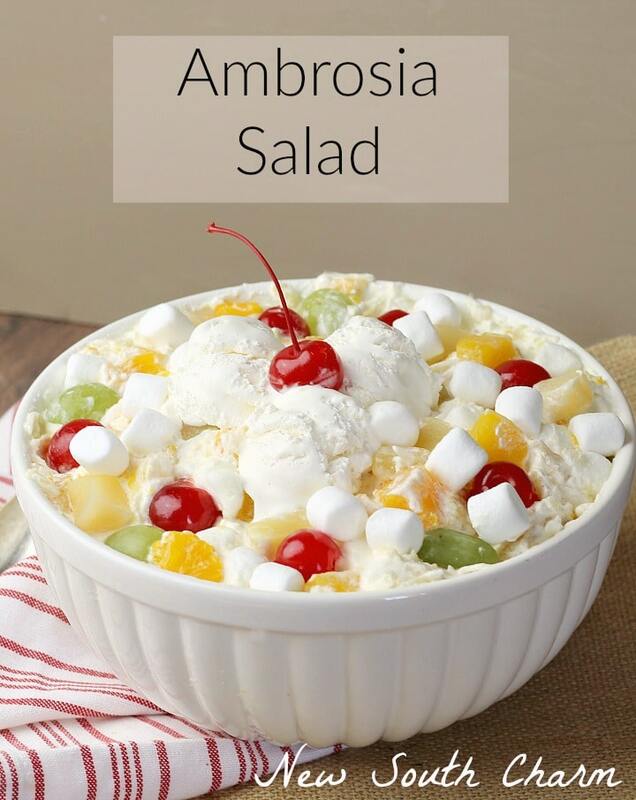 Ambrosia Salad is a creamy fruit salad that's perfect for feeding a crowd at Thanksgiving or Christmas. Oh, what a pretty salad! My name is Katie and I host Fall Into the Holidays, now open. All entries get pinned. I would love to have you link up! Yum! I remember eating similar salads when I was a child, such wonderful memories this brings back! Visiting from What’d You Do This Weekend? 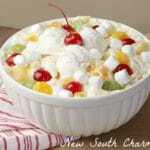 I had forgotten about Ambrosia – we used to have it at family dinners as well! It was lovely to read about your family traditions and your memories of your MeeMaw. Thank you for sharing this delicious recipe with us at the Hearth and Soul hop. Pinning! 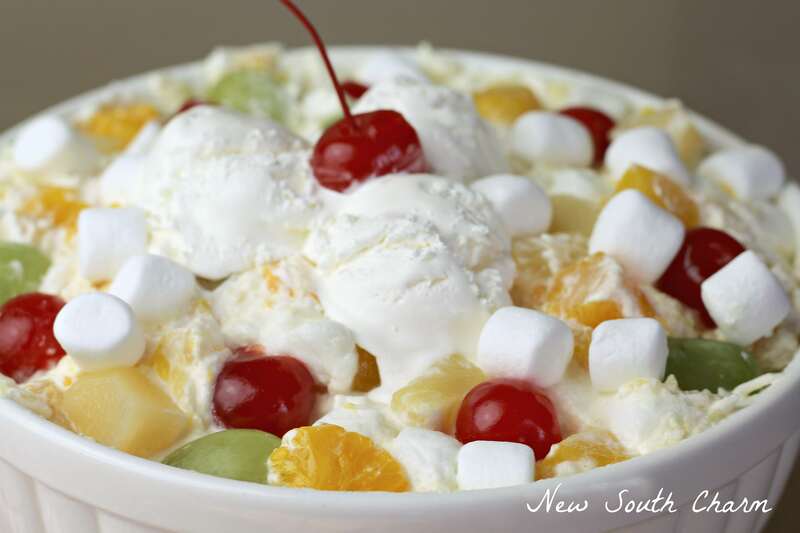 Just wanted to let you know that I will be featuring your Holiday Ambrosia Salad in my Hearth and Soul post later today. Thank you again for sharing it! The picture clearly shows coconut. My mom used to make this and it had coconut. Always an easy dessert and a family favorite! OH MY GOODNESS THIS LOOKS SO GOOD! Thank you for posting it in the MPM roundup! I’m adding it to my Christmas menu.